The role of the barbarians who find a home in Emperor Bettman’s ring is to forge the fury of balance and clenched fists while pulverizing the face and skull of the enemy. Any time players drop the gloves, they take part in the controversial piece of the dynamic hockey jigsaw puzzle. To witness a live NHL fight, one is subjected to viewing hockey’s highly popular sideshow. Fans revive the Roman Empire, as chants from the Dark Age fill the arena with adrenaline, in the heat of the moment screams of “kill him” and “rip his head off” fly through the air with every jab and hook that lands flush on the opponent’s visage. 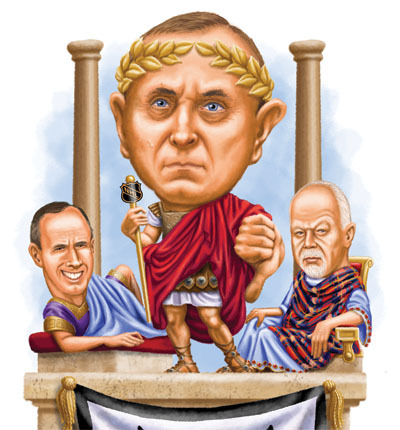 This physical frenzy does not need to be dramatized, although NHL commissioner Gary Bettman donning the robes of Julius Caesar with a laurel wreath atop his brown comb-over would be magnificent. The difference between your everyday hockey arena and the Colosseum is that bloodthirsty Romans implored their gladiators to kill whatever stood in their way, but the modern crowd of today has a threshold. As Hockey Night in Canada’s Jeff Marek explained, “No one wants to see the players leave the game on a stretcher.” Clearly, Jeff, the question is how much bloodshed will it take for fans and the NHL to realize that they can’t have their cake and eat it, too? While watching an NHL tussle, some spectators might be wondering why these bumbling hockey behemoths are even part of the league, the ones commentators dub ‘hockey heavyweights,’ or the less charming ‘goon’ label. They possess lacklustre ability on the rink, and high-calibre skill in the ring. If Mike Tyson is reading this article, we know you’re looking for work, even if whatever’s left of your dignity is on the line – this is not a job offer but when the NHL reaches out to you, then we’ll really know the league is in trouble. But seriously, what is its purpose? 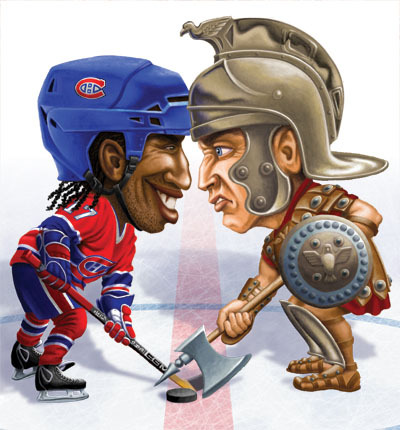 Someone would have to tie rockets to Montreal Canadiens ‘Heavyweight’ George Laraque’s skates if he dared to keep up with players in Europe, let alone his own league, let alone the old-timers league. The NHL should get rid of his kind altogether, the focus should be on the ‘three Ss’ – skill, speed, and size – not sitting on the bench getting paid over a million dollars a year to make a three-minute appearance every two games to ‘send a message’ to the other team. In Olympic hockey, fighting is not even part of the game. A fight in Olympic hockey results in a match penalty and the players involved in the scuffle are ejected from the game. Interestingly enough, studies in the NHL show that teams who win more fights throughout the course of the season go further in the playoffs. 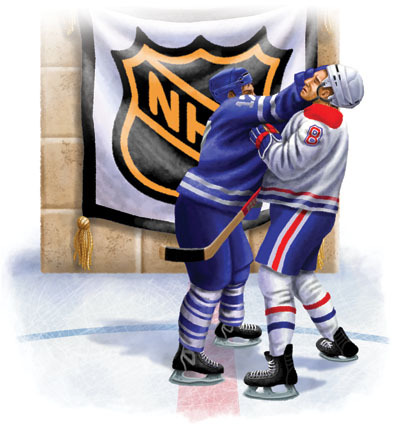 Fighting in hockey is a controversial topic that is older than the NHL itself. Over 100 years of hockey has gone by and still the great debate rolls on. 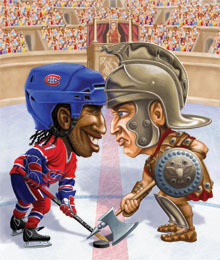 The difference between your everyday hockey arena and the Colosseum is that bloodthirsty Romans implored their gladiators to kill whatever stood in their way, but the modern crowd of today has a threshold. Bettman, mentioned above as the Emperor, could also be seen as the watchful eye that oversees the giant glacier that is hockey, from its summits to its pitfalls; Bettman is the man in charge. The latest controversy in Emperor Bettman’s arena has turned the white ice red. Even the shrewdest hockey loyalists are coming out and confessing that the possibility of someone dying from a blindside hit exists in the NHL. So far, the NHL has addressed the headline issue of blindside hits directly. The collision that really got people talking was Mike Richards’ blindside hit on David Booth, which sent Booth flying sideways, and his head into the unforgiving ice with a chilling thud. This incident stands out because both players live in the top tier of the skill hierarchy. After analyzing the Booth incident, GMs sat back in their cognitive chairs and pondered the possible financial dent their team would incur if they lost a franchise player like David Booth for an indefinite amount of time. Brett Hull pointed out on Hockey Night in Canada that players should be aware of who is on the ice in order to stay out of harm’s way. “Is it a finesse group?” he asked, “or has the coach sent out his ‘goons’, because if it’s the ‘goons’ then you want to watch out.” Hull’s advice is as solid as Bambi on ice. When the Booth hit took place, the ice was loaded with ‘finesse’ type players and Booth still got his bell rung. So when it comes to body checks, the league currently seems to acknowledge that hits from behind and blindside hits seem to be the most dangerous. The main rule change that has been causing all the fuss is the one that heightened the possibility of the bone-jarring body checks to occur in the first place. During the 2004 lockout hearings, clutching and grabbing was no longer allowed, and a minor penalty called interference was issued to the player if they clutched or grabbed an opponent with their stick or any part of their body. The goal was to increase the pace and create positive buzz. They were successful, but success had its side effects. The new NHL came with a warning label that speed kills, and recently in the juniors it almost did. Ontario Junior Hockey stud Ben Fanelli was caught in the undertow of a media tidal wave after he was hospitalized following a collision involving Erie forward Michael Liambis. Liambis is known to be an all-around gentleman. Unfortunately, there was nothing gentle about the hit that the 20-year-old Liambis made on 16-year-old Fanelli. Once again, Liambis was not interfered with and was able to skate nearly half way across the rink with speed before delivering a sickening blow to the young defenceman who was simply looking to careen around his goal and start the rush up-ice. Liambis was suspended for the rest of the year and his career in the Junior Ontario Hockey League was terminated, although many disagreed, saying the hit was legal. It was comments of that nature that got many people thinking. The question on a lot of people’s minds was a very simple one: if a hit that left a player hanging on for his life is seen as ‘clean,’ then what would a ‘dirty’ hit in that same situation have resulted in? Hockey had a bloody situation on its hands. The Liambis vs. Fanelli body check sounds like a court case and the OJH is lucky it didn’t get to that point. For 16-year-old Fanelli, the hit could have been worse, even fatal. He is lucky to be alive. If his hockey career is over on the ice, then Fanelli’s ultimate consolation prize is that the incident could be part of the necessary rule adjustment that could save the careers and possibly the lives of future players to come. One of the most talked about solutions to reduce unnecessary injuries in the NHL is to enlarge the area of the NHL’s rink and adopt the European parameters. The NHL says it’s out of the question, due to the structural layout of North American hockey arenas. The partisans in the higher seats would not only suffer a nosebleed but they would also leave the match with a sore neck because they would not be able to view the entire surface of play, thus causing a cost-benefit issue that would hurt the game more than it would help. For a league that struggles behind the other major sports in North America, the NHL can’t afford to go from a “collision game,” as Jeff Marek called it, to the less physical type of game seen in Europe. The NHL is sold to North Americans as “the fastest game on ice.” The new rules installed after the 2004 lockout have modified a fast game and made it even faster. Shouldn’t this heightened level of play be parried in the safety department as well? The benefits would outweigh the cost of tweaking the rules to ensure player safety. For instance, marquee players would presumably receive fewer injuries and be readily available to perform in front of the fans that paid to see them play at their peak level. Fans do not purchase a ticket to watch boxing on ice, or to see a player lifted off the air and crash head first onto the ice. It might be an incentive, but it isn’t the main reason, and surely it isn’t the best part. Hockey is most exciting when the game is free-flowing and players are skating from zone-to-zone, exhibiting their multi-dimensional range of skills that range from skating to stick-handling, passing, shooting, and the ability to separate the player from the puck and gain possession. And don’t forget the acrobatic goal-saving highlights that put the game’s greatest goalies under the brightest spotlight, game after game. Hockey and the NHL is enjoyed by millions and watched by even more. As Marek confirms, the game is the best it has ever been. For now, it seems like the NHL and the junior leagues have to rely on equipment upgrades and personal caution to ensure their longevity on the ice.